Have a newborn, infant or toddler? Wish there was an easy way to track their activities? ParentLove is for you! ParentLove is the best baby tracking app to record and report on all of your little one's activities, such as feedings, diaper changes and so much more. Passionately crafted by parents, ParentLove provides you with the simplest way to effortlessly record your baby's activities. 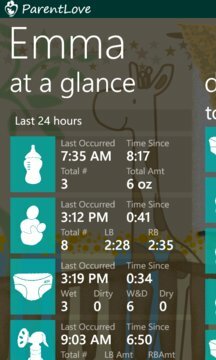 Use the "At A Glance" summary, to help with estimating when baby is due for their next activity. Use the Daily Journal to quickly review the most recent events to better understand your baby's routine. Tailor ParentLove to satisfy your individual desires. Favorites allow you to customize which activities are front and center allowing you to record events quickly and easily in as little as 2 taps! 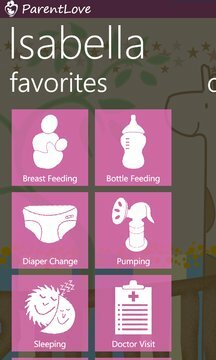 The data you record for each activity, such as a reaction or a bottle’s content, can be customized to suit you and your baby's individual needs. Timers allow you to record breast feeding, pumping and sleeping sessions. Reports provide you with views into your baby’s trends and growth patterns enabling you to make informed decisions and better identify possible concerns. If you desire, ParentLove gives you the ability to export all of your data to excel and create custom charts and reports. Last but certainly not least, all activities are securely and automatically synced to the cloud for safe keeping. Download ParentLove now and try the demo!